The arrival of spring always means one thing - lots of rain. Typically when it rains, it's an all day affair, though nothing stops those storm clouds from moving in on a whim either, and quickly transforming what was a bright, sunny day into a dark, damp one. I thought I could squeeze in some outfit photos after work before the rain clouds rolled in, but as luck would have it, the moment I got out of my car the rain drops started, so I fired off as many shots as I could before the storm worsened. At least you made a valiant attempt to get ahead of the weather - totally worth it to showcase this outfit, in my opinion! Hoping my last comment went through -- love the florals and stripes here! The pics turned out great :) Love how you paired the floral and stripes together. Very pretty! As a blogger - and worse still, a blogger in the Pacific Northwest - rain has been the bane of my existence for the past four and a half years. When it rains here, it tends to rain on and off all day, so just when you think you're safe to go out to snap photos, you wind up getting caught in it again. Not to mention that the extreme humidity alone is enough to ruin any hairstyle, regardless of whether it's actually raining. I digress. You look lovely and so very spring-like in these photos, despite the few rain drops of your handbag. I'm really looking forward to seeing more of your spring outfits now that the snow is finally gone! Love this mix. 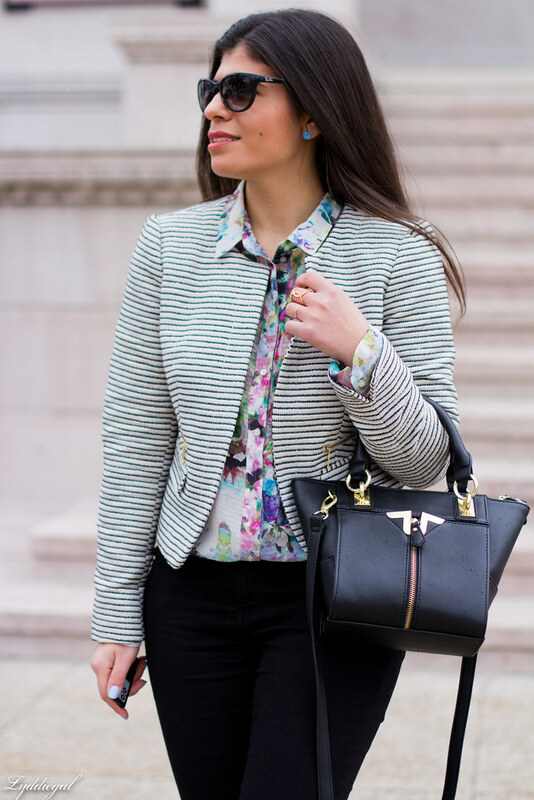 Floral and stripes together are perfect! I think you managed to get lots of great shots here! I love the pretty mix of prints, you really made those black jeans spring-ready! I could go for a rainy day :) Loving this look. 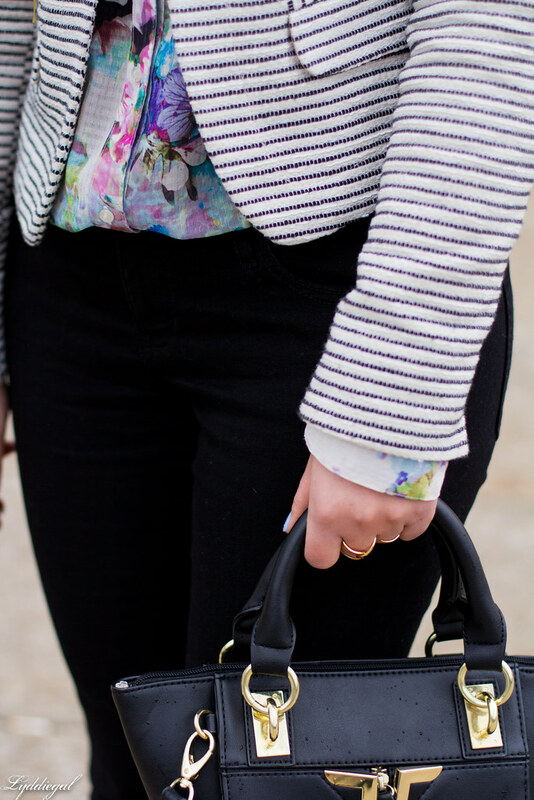 The stripes and floral make for a great combo! Lovely your vest and shirt, pretty look dear. Well for being on a short time, you got some really great shots! Darn rain! But in Colorado, we don't get rain very often so when we do, it's like cause for celebration! Love the stripes and florals! Well, I would have never known it was raining … I like the pattern mix and the earrings. Love that floral blouse! You look great! You can't tell that it's raining. The pictures are great. We are supposed to get rain all this week. I got some pictures in yesterday just in time. I love a good stripe and floral mix. 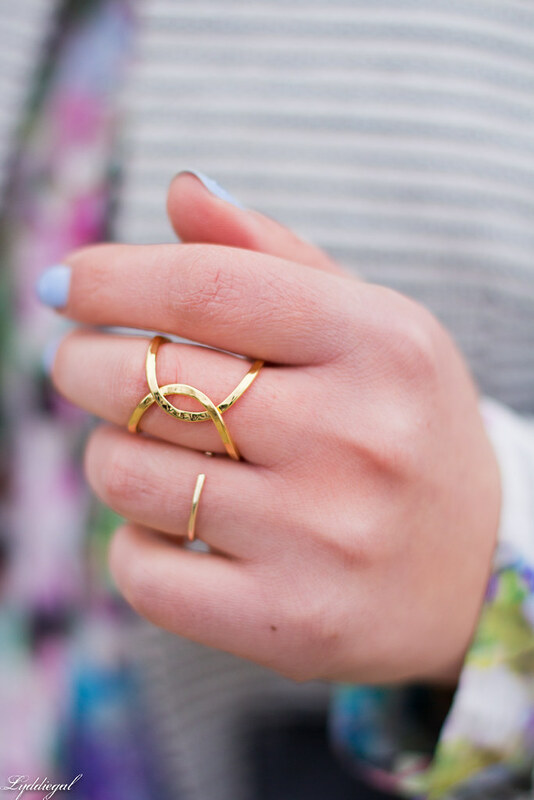 This is such a pretty springy look. Loving the print mixing! and that jacket is gorgeous on you! yay to no more coats, you look pretty love the print mix. What a cute business casual outfit! I really like the colors in the floral blouse. You look lovely. 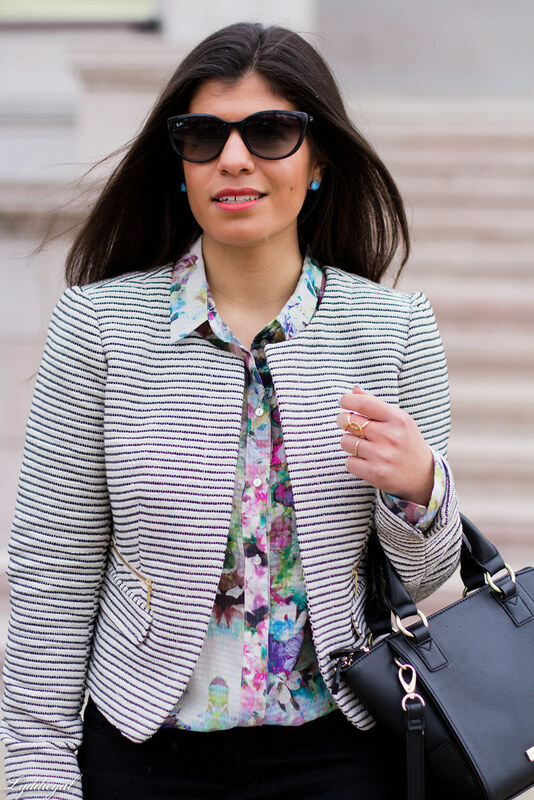 Great print mix and a great dose of spring color! this is probably one of my favorite outfit of yours! i love the stripes on top of the floral print! I love the mix of floral & stripes. You can't tell from these pictures that it's raining. We need some serious rain in California. I miss rain. I love your blazer, Great styling!!!!! Oh gosh, rain is my worst fashion blogging enemy here in Seattle heheh. Sometimes the weather forecast says it will be sunny but then it ends up raining and totally screws up my schedule. It doesn't look like it rained in your photos though and you look great! At least you got the pictures! The wind here has been absolutely insane the past few days...made for some interesting attempts at shots :) Loving the print of your blouse! 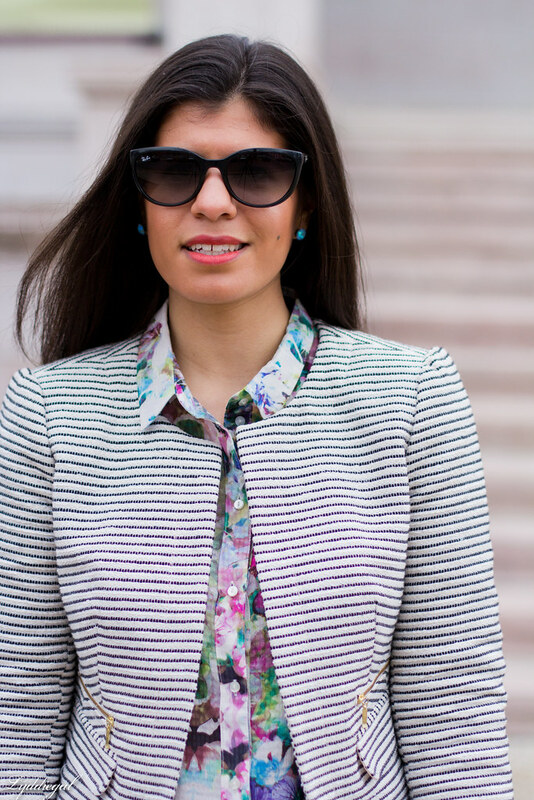 Stripes and florals are always a classic mix which I love. Sorry about the rain! You need to visit San Diego. A blogger's dream for shooting pictures. Love the colors and stripes on you.